We have decided to no longer sell Moxa products. Please see our selection of alternative solutions. 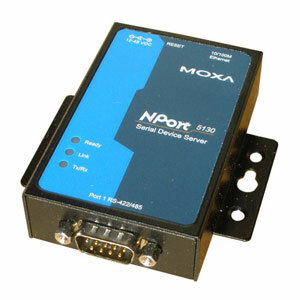 The NPort 5130 is similar to the NPort 5110 with the main difference that it has a RS485 / RS422 serial port instead of a RS232 serial port. The RS485 port has ADDC (automatic data direction control) and built-in adjustable Pull High and Pull Low Resistors of 1K ohm and 150K ohm, which is convenient if using the converter for long range RS485 commuinication where termination resistors are required. Another nice feature of this serial Ethernet converter is that it will work with both 2-wire RS485 devices and 4-wire RS485 device. This 1-port Serial to Ethernet (also called a serial device server) has one RS485 / RS422 port and can be used for most basic and advanced applications; so if you need a great entry level converter with many advanced features and functions then the NPort 5130 is for you. 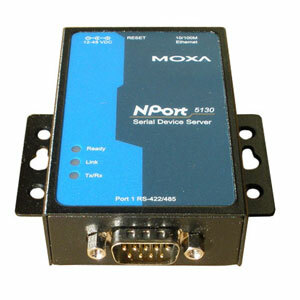 As with most of our other serial to Ethernet converters the NPort 5130 will work with most RS485 / RS422 serial devices. It will allow you to connect a serial device with a standard RS485 or RS422 interface to your computer over a local LAN network or even over the Internet (using a VPN or DDNS service). With the converter is included virtual COM software, also called administration software or management software, for Windows and Linux which is used for creating and managing the virtual COM port in your computer. As an alternative to managing the converter with software it can also be managed by using a standard WEB browser, or over a Telnet connection. 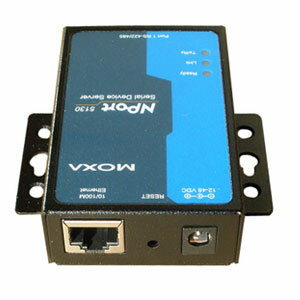 This serial to Ethernet converter will work in Real COM mode, TCP server/client mode, UDP, Paired connection mode, Ethernet Modem Mode, Reverse Telnet mode and Disabled mode. Furthermore many basic and advanced settings can be accessed and configured. Please see the user manual for a detailed explanation of these operation modes and parameters. 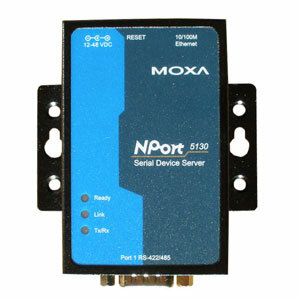 The NPort 5130 is designed around MOXA's own MX-1610C processor chip and a Realtek RTL8201 PHYceiver which makes this serial Ethernet converter a great all-round high performance and reliable converter which is ideal for most office, laboratory, workshop and other light commercial environments. For alternative serial to Ethernet solutions please see our full selection of serial Ethernet Converters. The product has been added to the shopping cart.